At last, we are taking time to send greetings to all of you. And how happy we are it can be in the glorious month of May, when we honor Our Blessed Mother Mary as Queen. This month is always full of fond memories for those who grew up Catholic. In the family home or in the Catholic school, the entire month was dedicated to honoring Our Lady, Queen and Mother, with prayers, flowers, original poems written by the children, and the final festivity and ceremony of the May crowning. We know many families continue these traditions in their homes. But even if we cannot do so, let each one of us honor our Queen in the depth of our hearts with prayers and offerings that a Mother’s Heart cannot refuse! The Most Holy Virgin in these last times in which we live has given new efficacy in the recitation of the Holy Rosary. She has given this efficacy to such an extent that there is no problem, no matter how difficult it is, whether temporal or above all spiritual, in the personal life of each one of us, of our families, of the families in the world, or of the religious communities, or even of the life of peoples and nations, that cannot be solved by the Rosary. With the Holy Rosary, we will save ourselves. We will sanctify ourselves. We will console Our Lord and obtain the salvation of many souls. Please be sure to look at our always-growing book offerings. How many times we have heard our spiritual director tell us of the importance of “holy reading” and how God gives grace through this key element of a good spiritual life. We can never recommend enough My Prayer Book as a superb guide and assistance for prayer. And it makes an excellent graduation or wedding gift. As well, we are offering a new edition of another Father Plus title: Christ in the Home. Do you think it odd for Carmelites to be offering a book about marriage and family? Married people are called to be saints too! – and to have a rich spiritual life. This, too, will make a wonderful engagement or wedding gift for your dear ones entering the married state, a most exalted vocation…so misunderstood in our day. Since the new pope’s election, we have noticed that many people are purchasing a St. Benedict medal, sometimes several of them at a time! This medal is one of the most favored and powerful sacramentals of the Church. One of the customs of using the medal is to place it above the entrance door to the home, as a protection and blessing of the home. We find ourselves with an abundance of a large 1-1/2 inch (38mm) St. Benedict medal quite by mistake, and so are offering it at the discounted price of US$1.50. It is imported from Italy, made of oxidized silver, and would make a lovely gift for any Catholic home. 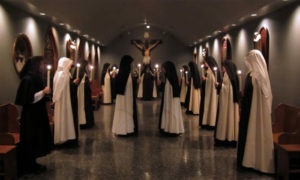 After illness within the monastery – the nasty ‘flu bug’ that hit Colorado in late winter – the Sisters are now all recovered. It came for all of us during Holy Week, so we had a Passiontide and Easter without chanting and singing, but penitential and prayerful in a unique way this year! This winter has kept us very busy with completing the necessary aftermath of our building project last year: re-modeling and re-organizing the older portion of the monastery to make efficient use of every inch of space God has provided for us. So, back to the noisy hammers and drills and saws and workers’ voices! But happily, we are near completion, and even now things are more silent and peaceful. “New” rooms include laundry, tool and utility, art/paint/flower room, and larger space and beauty in our choir (the cloister chapel). Many thanks to those who have continued to donate to Carmel, as these gifts have greatly assisted us with the expenses involved with the remodeling. And now, all the Sisters are “digging in” to our work outdoors: cleaning, weeding, planting. A few new roses this year, and a few new trees, all as a beginning of the much-needed landscaping since the monastery extension was completed. We welcome the time outdoors, since the spring was wintry. A blizzard in mid-April gave us 5′ drifts! But spring indeed is here now. We close this newsletter with grateful remembrance of all of the Friends of Carmel in our daily life of prayer. May Our Lady be with you!